I didn’t know exactly how my adventures of New Zealand’s North Island would go after attending TRENZ 2014, but I knew they would undoubtedly be one thing: spectacular. Well, I wasn’t disappointed. In fact, not only did I get to go tubing through Waitomo’s glowworm caves, go “ZORBing,” enjoy a cruise and helicopter ride in Rotorua, visit a top New Zealand agricultural attraction and munch on some delicious food, I also had an incredible personal experience at the Te Puia cultural site. And this was all in two days. Here’s a look at some top attractions and experiences New Zealand’s North Island has to offer. A second piece on the third and fourth days of my post-TRENZ adventures will follow in the coming days. A little over two hours from Auckland, the Waitomo Glowworm Caves are a sight to behold. Since being discovered in 1887, the Glowworm Caves have fascinated visitors for over 125 years. I was able to go on an experience via The Legendary Black Water Rafting Co. called “Black Labyrinth,” where you float through the caves on an inner tube while learning about the glowworms. There are also some thrills to be had, as you have to jump down from a couple small waterfalls inside the caves. There is a point in the adventure when you arrive at an opening in the cave and you’re treated to a magical visual display. Look up and find yourself mesmerized by the countless glowworms hanging from the cave ceiling. With your headlamp turned off, it looks like you are looking at a bunch of bright blue constellations. And what an ending. You finish your adventure by testing your skills at navigating the caves with your headlamp turned off, all coming to a head at the mouth of the cave as light streams in through the surrounding Waitomo forest. There’s also a well-known eel that hangs around one spot of the cave, and I saw two more as I explored the dark waters underneath me (don’t worry, the eels are friendly). Our guide said that many of the employees chose to work at Waitomo Glowworm Caves because they were scared of the water or dark spaces and wanted to overcome their fears. Visitors have also been known to overcome their fears inside the caves. The Legendary Black Water Rafting Co. also offers two other adventures for visitors beyond its walking tours: Black Abyss and Black Odyssey. Black Odyssey features high rope navigating, spider walking and ziplining (or “flying foxes” in Kiwi lingo). Black Abyss is the most comprehensive of the three, including abseiling, ziplining, waterfall climbing and tubing. Waitomo Glowworm Caves includes a visitor center recently opened in 2010 and a restaurant with outdoor seating (seats up to 250 people). Our media group was treated to a lunch menu that included antipasto, burgers, sandwiches, grilled vegetables, seafood, several different salads, and tarakihi. 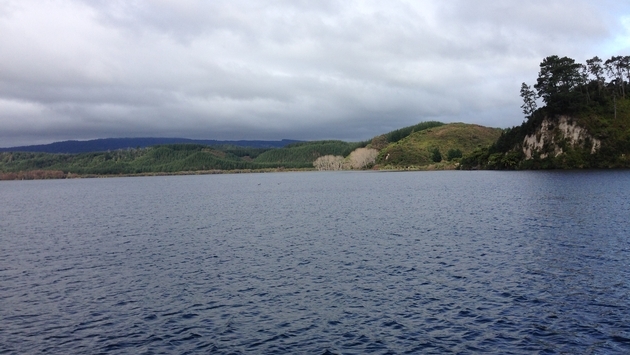 After visiting Waitomo, our media group headed to Rotorua, a cultural mecca on the North Island where the Maori people of Te Arawa call home (more on the Maori later). After freshening up at our first accommodation of the post-TRENZ trip, four-star Distinction Rotorua, we headed to local hangout spot Brew Bar in Rotorua for a pre-dinner drink. Brew Bar, a craft brewery opened in 2011, has a variety of beers on tap, as well as ciders and wines. Beers include pilsner, pale ale, stout, IPA and bock. No, I did not try all of them, but I can tell you the stout and IPA were very good. Brew Bar Rotorua has already been named “Best Bar” and “Best Bartender” (2013 Rotorua Hospitality Awards). The popular new spot was also a finalist in the Emerging Business category of the 2013 Westpac Rotorua Business Awards. After meeting Jehna White of Destination Rotorua Marketing and conversing, we walked over to CBK Craft Bar & Kitchen for dinner. I know I speak for our entire media group when I say the dinner at CBK was delicious. The two-month-old restaurant on Rotorua’s Eat Streat hub specializes in Pacific cuisine while offering a variety of craft beers and wines. I ended up ordering a 400-gram steak not fully realizing how much 400 grams really is (yes, I am an uneducated American), but I finished everything, including the vegetables and roasted potatoes on the side. What’s more, the meat at the restaurant is served on a sizzling stone. When it comes to meat, it’s a great way to be served. It allows you to cook the meat yourself in a matter of minutes, periodically turning it over so it’s cooked to your exact preference. Sure, I suppose some people would rather the chefs cook the meat for them, but stone cooking is actually really easy and adds an experiential element to your dinner. Tourism New Zealand would do well to keep CBK Craft Beer & Kitchen on its menu for future media trips. After resting up a little bit at Distinction Rotorua, it was off to Rotorua’s Agrodome, a 350-acre working farm boasting 1,200 sheep and 120 cattle, as well as a “Farm Show,” a farm tour, a shearing museum and a nursery with lambs, ducklings, baby goats, rabbits, calves and more. Our media group was lucky enough to catch the Farm Show. The first thing I noticed, of course, was the fact that 19 different types of sheep were plopped on the main stage, each with its own pedestal and name card. The guy doing our Farm Show was rather hilarious: part farm expert, part comedian. At one point, he conducted an “auction” for the sheep, where he would basically sign audience members up if they as much as blinked. He also made sure to give a good-natured ribbing to the Australian visitors. His shearing demonstration was remarkable, shearing a sheep in a matter of minutes (the official world record, held by Rodney Sutton of New Zealand, is 721 sheep in nine hours, less than 45 seconds per sheep). Our host also showed us how the dogs on the farm herd (with ducks…naturally) and allowed a few audience members to come up to the stage and nurse baby goats with milk bottles. My favorite part (and a perfect photo opp) was when he got three different dogs to run across the line of sheep on their backs. The Farm Show’s origins trace back to the 1970 World Fair in Japan. The first official Agrodome shows were in 1971. They’ve expanded from five minutes originally to one hour. If you haven’t experienced “ZORBing,” I fully encourage you to check it out. ZORB hails from Rotorua. You may have seen it on TV shows. Basically, you are strapped inside a large globe and sent hurtling down a hill. Don’t worry, it’s all safe. In fact, I went a step further at ZORB Rotorua and did the “Zydro Ride,” where the globe is partially filled up with water and you find yourself slipping and sliding head over heels inside the globe as you fly down the hill. I had three courses to choose from and chose the Zig-Zag track, which is exactly what it sounds like—you zig-zag down the hill on a path. The original ZORB site also offers “Zurfing,” where you surf inside the globe while it rolls downhill. Far out, dude. ZORB first opened in Rotorua in 1995. It has since added two more sites, ZORB Smoky Mountains in Tennessee and ZORB Amesbury in Massachusetts. More sites are in the works, including one in Los Angeles. ZORB also hinted at a TV broadcast in June that involves one of the top three Australian trade shows at one of the top three rivers in the world. Anacondas and piranhas included (hint, hint). Would I recommend the Pure Cruise experience? 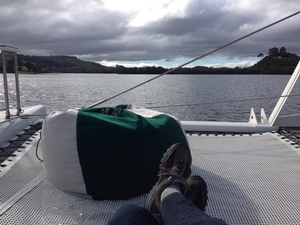 I’ll just say I could have stayed on Lake Rotoiti forever. Pure Cruise, highlighted by a 53-foot catamaran named “Tuia,” does a great job. The catamaran includes an inside lounge area and bar, two separate rooms with beds, an outside dining and seating area and beanbags to sink into on the main deck. The general charter is about three hours long, accommodating from two to 50 people. Along the way, you’ll see a variety of wildlife passing by, including ducks and swans. That’s not to mention the surrounding area, which includes lush green foliage and ferns (I’ve learned that I love ferns, and New Zealand helped me realize that). Our main host, experienced sea captain and marine engineer Matt Horder, was a great guide. He had a laid-back, friendly demeanor that only added to the peaceful journey, and I could see why Pure Cruise was successful. It all starts with the people, after all. Horder said that you needed to accumulate 4.5 thousand miles to be a licensed captain (among other things), which, as he casually pointed out, “is just like crossing the Atlantic.” That’s all, huh? Horder said he had registered more than 35,000 thousand miles out on the water. As if lying in a beanbag on a 53-foot catamaran in a gorgeous setting wasn’t enough, Pure Cruise also offers barbecued meals and beverages on board. Our media group’s menu included three different meats (lamb, chicken and beef), lamb kabobs, sweet potatoes, bread, a garden salad and another large salad with zucchini, mushrooms and bell peppers. Several different sauces accompanied the delicious and well-cooked meal. This is when I knew Horder understood me, and hospitality in general. The lakeside Manupiruia Springs, owned by a local family that lives on site, includes three different soaking pools, each with a different temperature. Media members each took turns braving the hotter pool before it all came to a climax when Jon Underwood, managing editor of Australia’s Traveltalk magazine (and a true character), flew down the nearby dock’s waterslide into the cold waters of Lake Rotoiti. That started a chain reaction that had virtually ever male media member jumping into the lake (call it primal instinct). To cap it all off, we had cheesecake, fresh fruit and little desserts with kiwis and whip cream on the voyage back to shore. Side note: A burst of contemplation hit me on our cruise. For one, the cruise reminded me of when I was a kid and my dad and I used to cast off on his sailboat. Secondly, thinking about my dad randomly got me thinking about the baseball movie “Field of Dreams” we used to watch together where an Iowa farmer mows down his crops and builds a baseball field, inspired by a voice from somewhere (maybe his head). That then got me thinking of one of the movie’s famous dialogues. Replace “Iowa” with “Lake Rotoiti” and that will give you an idea of how I was feeling as I walked up to the helicopters after cruising on a luxury catamaran. I had been gazing at one line in my itinerary from Tourism New Zealand for weeks leading up to my New Zealand trip. Naturally, I was hooked, and desperately hoping the weather would be suitable enough. Well, the weather turned out to be suitable enough, and here I was, boarding a helicopter for a flight over picturesque Rotorua. There was a little drizzle during the flight, but nothing that would get in the way of my pictures or video of the journey. As far as the journey goes, I’m just going to go ahead and show you a picture and video I took. No words needed. 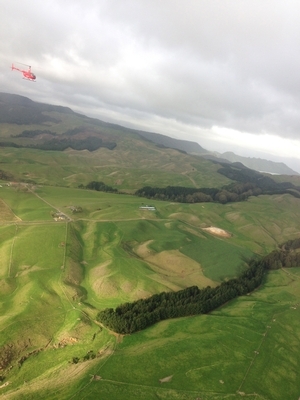 As for HELiPRO, the New Zealand-based company has been operating since 1983 (I was born in ’83! It was meant to be!). It now features more than 35 helicopters across New Zealand, Australia and Fiji. The company offers leisure and commercial flights. Go on a flight—it’s well worth it. Then again, I don’t need to tell you this. Just let your eyes wander back to my pictures. You can also probably tell that the cruise and helicopter ride were my two favorite parts of my post-TRENZ adventure. After driving back to Distinction Rotorua and relaxing/absorbing what I just experienced for a bit, we were off to Te Puia, a top Rotorua attraction and New Zealand Maori Arts and Crafts Institute. The site itself features a variety of mud pools and geysers, including the famous Pohutu geyser, all within the scenic Te Whakarewarewa Valley. There’s also the Kiwi House, which features a couple of New Zealand’s national birds, and a Maori treasure gallery. The institute includes national carving and weaving schools. You are welcomed by 12 encircling monumental carvings forming Te Heketanga-a-Rangi (Heavenly Origins). Our media group was treated to the “Te Po Combo” tour, which included a traditional Maori welcome ceremony, a KapaHaka (performing arts) concert and a Maori feast. We were welcomed by Te Puia marketing managers Eruera and Renata West, who I was able to catch up with again after meeting them at TRENZ. Not only is Te Puia a cultural site that truly gives you an authentic experience, it was also a very personal experience for me. For the welcoming ceremony, one of the guides asked a healthy crowd comprised of three different media/tourist groups if there was a brave man out there who would volunteer to be “Chief” of our tribe of sorts. No one was budging, myself included, but it wasn’t long before my media group was basically pushing me up front. I still don’t know why my group chose me in particular to go up there, but after initially having a moment of why-are-you-doing-this-to-me I’m ultimately really glad they did so. It was an unnerving moment at the time, but what I should have been doing was casting away my anxiety and doubts and happily accepting a true gift the world was giving me. In fact, my role as Chief started out with me actually accepting a gift from a Maori warrior. He approached me with a traditional Maori dance/intimidation ritual, zig-zagging toward me with a spear while sticking his tongue out with bug eyes and shouting/grunting (hence, the “unnerving” part of the experience). I was told before he approached me to accept the gift and then walk backwards to my tribe (slowly, cautiously backing away, in my case). Turning your back on the warrior during the ceremony is a no-no, and I wasn’t about to test this. Apparently, I did alright, and we were accepted into the KapaHaka concert. Plus, I now had a cool silver-reflecting fern indigenous to New Zealand (given my newly discovered love of ferns, it was pretty much the best gift I could have received). It wasn’t over for me there, though. I was told that I needed to greet the Maori in their traditional greeting, which involved (get this) pressing each other’s noses together twice (it may be natural for the Maori, but it was just a wee bit uncomfortable for me). Not only that, there were about 10 Maori warriors I had to greet each in the same way. I returned to my seat afterward, wide-eyed and secretly hoping that the Maori had instilled some kind of magical power in me with the touch of our noses. Well, it turned out some power was instilled in me after all. Just the act of being accepted as Chief and going through the initiation process gave me an added inner confidence that is hard to describe. Plus, I’m not gonna lie, random strangers greeting me with “Hi Chief” throughout the night wasn’t too bad, either. The ceremony itself was a sight to behold, complete with Maori dances, music and singing from warriors and women tribe members. Audience members were invited/encouraged to come up on stage. The guys learned and performed/attempted a traditional Maori dance. The gals swung poi (or tethered balls) in the air while swaying their hips. And, yes, my media group captured pictures of me performing the dance and, no, they are not on Facebook…yet. It all ended with a fantastic feast at one of Te Puia’s tents, heated by the site’s natural geysers in a steam vent. Surprisingly to me, everything was cooked perfectly (it’s, like, food can be cooked well in other places than restaurants or something). I left Te Puia with a full belly and a magical feeling. And, no, that “feeling” wasn’t a result of the wine I had drank. 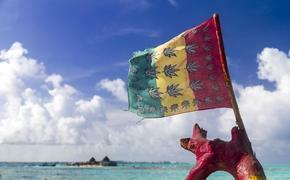 As most die-hard travelers have probably discovered by now, traveling is about more than going to some exotic location. It’s about truly experiencing life and exploring the world around us. Life is meant to be full of happy moments…and full of unnerving moments, as well. The discomfort I had experienced early at Te Puia had evaporated by the end of the night and strengthened what I have recently come to truly understand: breaking through those uncomfortable barriers we all have (whether real or imagined) can be tough at first, but you only open up a new world for yourself by breaking through those uncomfortable barriers. Those barriers can be broken by something as simple as successfully completing your task as “Chief” for one night. I know some walls came falling down for me, unveiling a more peaceful and serene world on the other side. Stay tuned for Days 3 and 4 of my post-TRENZ adventures.